Fieldcrest High School art students have enjoyed three opportunities to show their work and compete with other high school students for recognition. We held our annual show in conjunction with the spring musical. Melanie Klieber, former FHS art student and Art Guild (honors art group) member judged the show and awarded two hundred first, second, third and honorable mention ribbons. We then attended the first annual HOIC art festival at Deemack High School where our students won more ribbons and participated in workshops taught by ISU art students. The final show was a weekend show in Ottawa sponsored by the Ottawa Art League where fifty FHS students won ribbons. handmade games which will be on display and ready to play. Food and drinks will be available. Please come and view the show, meet the students, myself and Ms. Naschert. Looking forward to seeing everyone there. I was wondering if you could let everyone know that El Paso Swim Team will be starting their season soon. The parent meeting is May 7th and the first meet is June 12th. If anyone is interested, please contact Leslie Ludwig @ 432-2400 or 309-297-2008. Swim Team is open to grade school ages through high school ages. I would like to thank everyone who supported me in this year's election for Minonk FPD Trustee. Your votes are truly appreciated. I would also like to congratulate Gary Wolf and wish him the best in his upcoming years as a Minonk FPD Trustee. I just wanted to congratulate all of my students who tested Saturday, April 14. They all worked hard and did a great job. Those who advanced are as follows. Also advanced to Yellow belt, is Kathy Jackson who tested on Monday, April 16th. For those who did not receive a T-ball sign up form at Kindergarden Round Up there are forms at City Hall. On February 16th, 2007 a very tragic car crash occurred, that will forever affect many, many people. Three wonderful young people, Curtis Turner, Jaqueline Mouwer, and Eric Moore, were taken from us forever. We as a family are devastated by the loss of these children. Our daughter Angelia Hill was driving that car, and was not expected to be with us today herself. We know that Angelia's continued progress is nothing short of a miracle. Angelia loved her friends and will forever miss them. We would like to thank everyone who has shown us support and compassion over the last 7 1/2 weeks. All of the prayers worked, and caused the miracle of Angelia's survival, and we are forever grateful. For every prayer, every word of comfort, and encouragement, and for everything no matter how small or big that has been done for us, THANK YOU from the bottom of our hearts. There will be a Bake Sale from 8 - 11 in front of Visions this coming Saturday the 14th. Items will be donated by the St Paul's UCC. This event will aid in the mission trip the Sr. High Youth will be taking in June. The mission trip this year will be to Denver, Co. To a homeless teen center. Hope to see you at the sale, and your support is always appreciated. The April meeting of the CAC which is scheduled for tomorrow night (April 11, 2007) has been canceled. Several people have commitments elsewhere. Mostly me because I am in the middle of Tech week for the play. We will have the next meeting on May 9th, 2007 at 7:30 p.m. in room 207 at the High School. Do you know someone from the Minonk area who is currently serving in our armed forces? The Village-Aires plan a special salute to veterans and current service men and women during our 40th anniversary show on April 28 and 29. A multi-media presentation is planned, and we would like to include pictures of those who are presently serving our country. If you have a photo of a current service person, please contact Elaine Cunningham, 432-2249, or email cunnghm@fieldcrest.k12.il.us. Pictures are needed by April 16 in order to prepare the presentation. We hope to have many pictures to include. Thank you for your help. The MidState Stars Soccer team cleaned tables and washed trays at the Gridley Community Center for the Gridley Community Sale Day on Saturday. This was one of the many fund-raising opportunities that the MSSC is planning to participate in to raise funding for club equipment and activities. Developing great players is not just our goal, but also developing great young adults. I just wanted to let everyone know that there will be a special rec board meeting Thursday, April 5 at 7:00 at City Hall. The meeting has been set up to discuss changing the cut off date for summer rec programs from April 30th to September 1st. This would allow children to play with their classmates, which is not always the case with the April 30th cut off. I would encourage anyone affected by this to attend this meeting. I have a few comments about the Editorial this month. A sport does so much more than cost the taxpayers money. Some examples it teaches the kids, teamwork, trust, self-esteem. The biggest thing is it creates pride in the school system and community, not just between the students, also the community. About the chart that is shown with it's percentages, by how low those numbers are I would bet those are division 1 athletics, there might be 1 student from the Fieldcrest school system that will be able participate in division 1 athletics about every 10 years. What those numbers don't show is the percents that go to a division II or III NCAA or even a division II or III NAIA school. Believe it or not pretty much all kids realize when they are playing high school sports they are not going pro, they may dream about going, but reality does set in. Then you ask why do they do it, do you ever think that the kids have fun playing those sports, they are out there for 2 hours a night playing the game. During this time they are not worrying about the homework assignment that is due tomorrow, girl/ boy friend, which students like/ dislike them, their chores they have to do at home. All they have on their mind is that game. In the editorial there are a lot of other activities listed, yes those are good activities if you enjoy those thing, not everyone enjoys farming, band, chorus, cooking, & MATH. There are students that are attending school for 1 reason, sports. If they never had the sport they enjoy playing, they would be skipping school, and probably failing. Since they have to have a passing score to participate in Extra Circular activates these student keep up their grades so they can play. Sports also help keep kids from drinking alcohol; believe it or not there are a lot of kids that do not drink because they are participating in sports. Extra Circular activities in the Fieldcrest school system are not funded by the school system, the student that plays have to pay. You have mentioned why not intramural sports program. There are roughly 400 students in Fieldcrest high school, out of these 400 you may get 25-50 that enjoys a sport, and then you divide them up into teams and play. You might get 2 or 3 games in then your back playing the same team over. This might work for a year then the kids will get tired of playing against their friends, the community will stop showing up especially if they have to pay to watch this. Intramural sports are just a glorified P.E class, it still cost money run, just ask the rec-board what they spend a year on Intramural sports. There is a comment about some sport pays for itself other don't. It's not just the money the gate brings in. The classes sell concessions this pays for class trips, cancel sports; money will need to come from some other place. Sports bring a community together, people enjoy watch sports played, if they didn't it wouldn't be a multi-billion dollar business, and that's just at the college level. The biggest problem with the school system now is that it is set up to educate children to go to college. Guess what? Not every kid is going to college. To save money first classes cut are the industrial classes, the classes that give the student some skill to go out and get a job out of school. If they are going to start cutting thing why not Chemistry or Physics classes, you might only have 10-15 students in each of these classes, but you'll have 100's of student participating in sports. Since there was not a formal Class Reunion planned. Betty (HERMAN) Barth, Marie(TUCKER) Stimpert and Colleen(BAKER)Bagley decided it would be nice to try and get everyone we could contact to go dinner. We have the banquet room at Monas in Toluca reserved for Saturday July 7th. Cocktails at 5:00 pm and Dinner at 6:00 pm. If we have less than 40 we can order from the menu, if we have 40 or more we have to use their banquet list. We need to know how many are coming ASAP, so please pass this on to as many classmates that you can and have them notify one of us. Hope to see you all on July 7th!!!!!!!! Need some baked goods for Easter? Too busy to bake? Then come to the Village-Aires sponsored Bake Sale at Pop's on Saturday, April 7, 10:00 a.m. until everything is sold. Delicious fruit pies, cakes, cream puffs, cupcakes, cinnamon rolls, caramel rolls, crisps, scotcheroos, dinner rolls, and other items will be available. The Village-Aires is also sponsoring a raffle to benefit Relay for Life. Betty Barth has donated a framed Thomas Kinkade work (16" X 18") titled Clearing Storms, which pictures a seaside scene and lighthouse. The raffle will be held on the last day of the spring concert, April 29. The picture is on display at Alpha Community Bank in Minonk. Tickets are $1 each or 6 for $5. Speaking of concerts, this is the Village-Aires 40th year of entertaining in Minonk and the surrounding communities. Their celebration concerts are Saturday, April 28, 7:00 p.m. and Sunday, April 29, 3:00 p.m. in the Fieldcrest High School Gym. People may become a Village-Aires Patron with a donation of up to $100 or a Patrons' Circle member with donations of $100 and over. Patrons' Circle memberships entitle the member to complimentary tickets, attendance at a Saturday evening reception, and special seating for the concert. Please support these community endeavors. We just wanted to say Congratulations! and to wish the Fieldcrest Middle School Scholastic Bowl team GOOD LUCK tonight at Sectionals in Morris!!! We're proud of you!!! Art Wilson received a wonderful 74th birthday present from the Golf Gods at Snag Creek Golf Course on the 5th hole where he made a hole-in-one using a 6 iron on the 140 yard hole. Congratulations and Happy Birthday Art. Witnesses were Walt Fredricks of Metamora and Larry Stith of Minonk. Just wanted to reminded everyone that the St. Paul's Youth Chicken Fry will be held Saturday, April 28th from 4:00 - 8:00. The dinner includes: 1/4 Chicken, Potato, Green Beans, Bread and Dessert. Carry Outs are also available. If you would like to call ahead for a carry out, please call 309-432-2992 with your order and name and we'll have it ready for you as soon as possilbe. Cost of the dinner will be 1/4 Chicken $6.50 and Children $4.50. This year the profits will help fund our mission trip to Denver, Co to the Denver Plunge and will be working at Urban Park a homeless teen shelter. Our mission will take place from the 6th - 12th of June. Dave, I am looking for the recipe of the Banana Sour Cream Walnut Bread that was sold at the Village-Aires bake sale held a couple weeks ago. It is the best bread. Thanks. Having worked as an environmental geologist since 1989, I hope I can shed a little light on Barth Weistart's questions. typically very, very slow. However, if a well is drilled through the clay and not sealed properly, all bets are off. In addition, farm wells may have punctured the layer and later abandoned (a lot more people lived in the country 50 years ago). Further, each contaminant behave differently, some break down, some stick to the clay, some rise to the top of the water table, some sink to the bottom, some dissolve and move with the water. So you can see the difficulty in trying to make an assessment. It can be done, but it takes time and lots of money. With respect to cancer clusters, they are very difficult to identify, especially in rural areas where the population is low. A study recently completed for a Pontiac group examined the area around that city and found only one possibly elevated type of cancer and that was iffy due to the small numbers involved. http://webapp.cdc.gov/sasweb/ncipc/leadcaus.html is a good place to look at the numbers. In Illinois (2004), cancer (malignant neoplasms on the CDC site) were the #1 cause of death for ages 45-65 and #2 after age 65, and its always in the top five. Cancer was responsible for 1 out of every four deaths in Illinois in 2004 (and almost 2 out of 5 for age range 55-65), so its not surprising so many of our friend die of cancer. Cluster studies usually look for high rates of unusual types of cancer. If you are concerned enough to want further investigation, I recommend calling the IEPA in Springfield and Sen. Rutherford's office in Pontiac. You may also call me at IVCC at 815-224-0394. Dave, something that has been bothering me is the number of deaths from cancer in Minonk. When I read an obituary on MinonkTalk and inquire how the person died, in most cases it's from cancer. I know other people who have fought cancer and are hopefully in remission. The thing that keeps coming to mind is the garbage dumped in the coal mine shaft. The shaft was 500 feet deep. It passed through two and possibly more water tables. This water is flowing and would carry contaminates with it. Most water is filtered by scores of feet of earth before it reaches the water table. With a shaft cut through various layers of ground, the filtering action is lost. The City wells are 3 to 4 times deeper than the shaft and this may be enough to insure a pure water supply. My questions would be: 1. When City water is tested, does it include a test that would disclose cancer causing substances, and 2. Is there any way to test water in the tables that are in contact with garbage dumped into the shaft? Editor's reply: I agree that there seems to be an inordinate number of cancer deaths in this region. I don't know if there are statistics to confirm or dispel these fears. Does anyone out there have answers to Barth's questions? I thought your readers would like to see the customer application of some local products, manufactured here in Minonk. This flatbed trailer was parked at the Minonk Fast Break truck stop during lunch. 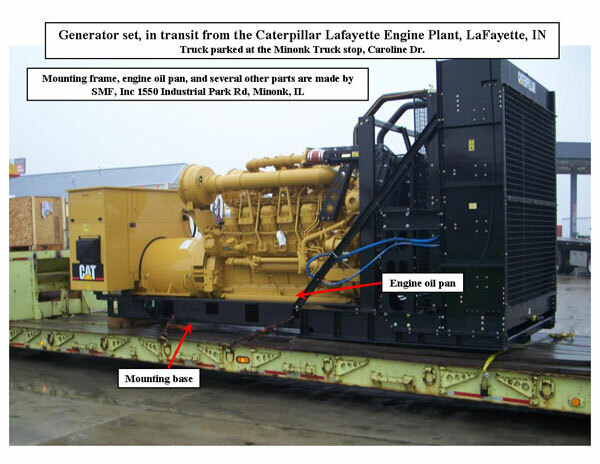 It had a large Caterpillar generator set on it, which was assembled at the Caterpillar plant in Lafayette, IN. The Lafayette plant uses many engine mounting bases, and large fabricated oil pans, that are manufactured here in Minonk by SMF, Inc. SMF, located at 1550 Industrial Park Rd, makes a large number of fabricated parts for Caterpillar, and other large companies, that are used in assembled products that are sold worldwide. It's ironic that the SMF parts started their journey here in Minonk, went to Lafayette as component parts for Caterpillar, and are now traveling a few hundred feet past their "birthplace" as part of an fully assembled product. We want to thank the Minonk fire department for their quick response and a job well done. You are a dedicated group of men that are truly comitted to getting the job done. Also thank you to our neighbors and friends for their concerns and willingness to help us after our fire. I wanted to let everyone know that their local Cub Scouts will be outside Minonk Foods this Saturday (4/14) selling candles to raise money for their pack. Please show your support by coming by and purchasing a candle. The candles are from Home Interiors, and make great gifts for any occasion. Prices start at only $7.50. The times we will be there is dependent on the weather. Please support me as I take an amazing journey in the fight against breast cancer! The Breast Cancer 3-Day is a 60-mile walk over the course of three days. Net proceeds benefit Susan G. Komen for the Cure and the National Philanthropic Trust, funding important breast cancer research, education, screening, and treatment. I'll be walking August 10-12 and I need to gain your support and the support of everyone you know to make it to AND BEYOND my $2200 goal. Won't you please pledge and pass the site along to others that can help? It was another great year for our annual pancake and sausage breakfast. We are very fortunate to have a community that comes out to support this fundraiser. In the past, the money raised has been used to buy pagers, extrication tools, equipment to help with the upkeep of the trucks and station, and many other items. way to serve your community! This event has become a tradition in Minonk where people enjoy a tasty breakfast and visit with friends and neighbors. We hope you enjoyed it and look forward to seeing you next year! It is my grandson's birthday on April 17. Since he is in Kuwait I thought it would be pretty neat if some of us sent him a birthday card. His address is Matthew Kalkwarf 386 ECS/SCMT APO AE, 09855. I am too old, too far away from my high school, college, and teaching years, far to late in my parenting life, too out of touch and too "achy" to even throw a horseshoe or bend over a pool table for any length of time and way too uninformed to even try and defend the various high school and college athletic programs in order to debate Eric Olson's rationale for replacing athletics at schools like Fieldcrest. Perhaps by eliminating organized sports, we could give the kids more time to phone friends, cruise Minonk, ElPaso, Wenona or even Peoria streets, text message, instant message or comment on "my space", or even create an arcade game that lets the player stuff basketballs, hit home runs or out fake an opponent on a football field. I would hope that there are many more experienced educators and parents than I out there who could make a better argument than this!! !